Mexican Gold Pesos have a fineness of .900 (21.6 carat) pure and represent excellent value for money. These highly popular coins were produced in limited numbers over several periods between 1921 and 2009 and, like all gold bullion coins, they’re VAT Free at coininvest.com. 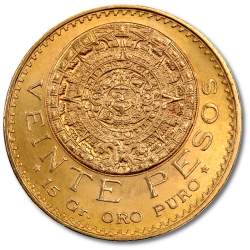 The Gold Peso is often referred to as the Centenario since it was originally launched by the Bank of Mexico in 1921 to mark the first 100 years of Mexico’s liberation from Spain. Peso gold coins feature the famous ‘Winged Victory’, the symbol of Mexico that has since been used on Mexican Gold and Silver Libertad coins. The reverse of the Gold Peso shows the Mexican Coat of Arms. The Mexican Peso offers exceptional value for investors as they only carry a small premium compared to other bullion products. With a fineness of .900 pure gold content, the bullion coins are 21.6 karat gold thus offer great value for money - and with the promise of excellent returns on investment. Production of Mexican Peso bullion are limited thus they are collectable assets worthy of any coin collection and highly sought after by enthusiasts. Buying Mexican Peso bullion from the CoinInvest online store could not be easier. Simply select the coin of your choice by clicking on the image from the selection above to go through to the product description page. Here you will find the relative pricing apportioned to the number of coins you wish to buy together with more information about the history and value of the individual coins. To buy the coins, click on the 'add to cart' button which is highlighted by the orange strip and found in the volume pricing section of the properties table. Once you have added the bullion of your choice to your shopping basket you can either proceed to checkout or continue to browse our online store for other great deals. The Mexican Peso was originally minted in 1921 to celebrate the first 100 years of liberation from the Spanish. The coin is also known as the Centenario, meaning centenary in English and is issued by the Bank of Mexico. Before the Spanish conquest in 1519, the native Indians of Mexico were a thriving culture in astronomy, economy and architecture among other things. However, they were also a deeply spiritual culture and believed in legends that their Sun God, K'ukulkan would return from the seas. K'ukulkan is described as wearing long hair and a gown – just like the Spanish Jesuits. The Spanish conquest was led by Hernando Cortez who confided in the Aztec leader Montezuma and earned his trust. The Aztecs unwittingly allowed the Spanish into their camp, but were soon betrayed and overrun by a small Spanish army despite the Europeans being heavily outnumbered. Cortez made up the numbers by seeking help from other native Indian tribes who were the enemies of the Aztecs. But the Spanish would later betray them also and the native Indians were enslaved and the land was redistributed amongst the Spanish nobles. Mexico remained under Spanish rule until they finally gained independence in 1821 – a war that lasted almost eleven years. In 1810, the Mexican Indians reclaimed back their first towns and villages, most notably in Ayuntamiento which was the scene of a coup staged by educated Mexican elite following the abdication of King Ferdinand VII of Spain who gave his throne up on the orders of Emperor Napoleon Bonaparte (see also 20 French Francs, Napoleon Bonaparte). Between 1810 and 1820, small rebel groups formed and bloody battles were fought against men loyal to Spain. In 1820, the Mexican elite that were loyal to Spain backed down and came to a compromise with rebel factions to form the Empire of Mexico. The treaty was signed on 27th September 1821. When the Mexican Peso gold bullion coin was first minted to commemorate the country's independence, it measured 37mm in size and contained 1.2 troy ounce of pure gold, the largest gold bullion of its kind for the time. Although the Mexican peso has since been eclipsed the bullion pieces still represent excellent value for money and are an attractive addition for buyers to build their investment portfolio. The design of the Mexican Peso has a distinctive image that was later used in the gold and silver Mexican Libertad Series. The obverse bears the symbol of the Winged Victory, El Angel de la Independencia which has become synonymous with Mexico. In her raised right hand is a laurel wreath, a symbol of glory, and broken chains in her left hand, a reminder to future generations that the country is no longer enslaved. In the background of the coins are two of Mexico's most famous mountains, Popocatepetl and Iztaccihautl. The obverse of the coins also have two dates, one being the significant date of 1821 marking the date of independence and the other marking the year the coin was minted. The last year of the original series was minted in 1931, but production began again in 1943 following a demand for gold bullion around the globe. Coins minted between the years of 1949 and 1972 show the date of 1947 and are known as restrikes. They typically carry small premiums, whilst the early coins struck between 1921 and 1931 carry high premiums. On the reverse side of the coins is the Mexican Coat of Arms which depicts the Mexican Eagle, or Caracara, which is actually a Vulture. The bird of prey is seen perched on a cactus holding a serpent in its beak. Production of Mexican Peso coins has taken unusual twists and turns in that mintage is inconsistent and limited. Up until 1972, the Mexican Peso was among the most popular bullion on the market, but with the introduction of the South African Krugerrand which targeted consumers and pushed up the price of gold bullion, the Mexican Peso gold bullion fell out of favour with investors. As a result production stopped until 2002 when the coins were minted for a further seven years before production was halted again despite the demand for gold bullion around the world caused by the 2008 banking collapse. Gold Mexican Pesos minted from 1949 onwards also carry the date of 1947 and only carry a small premium whereas coins minted between 1921 and 1931 are highly collectable and draw higher premiums. The coins contains 37.5 grams of pure gold, around 90 per cent of the metal content, The other 10 per cent is made up with copper which enables the coins to be more durable. The Mexican Peso is an attractive investment because of their rarity. They are often difficult to get despite their low premiums, which makes them all the more appealing to collectors who are willing to pay a reasonable price for them. Thus the Mexican Peso comes an invaluable asset for casual investors looking to profit from gold bullion investments. The Mexican Mint was established by the Spanish in 1535 and is the oldest surviving mint in the Americas. The centuries of manufacturing quality continues today and the Mexican Mint has an international prestige that is recognized for its outstanding quality of bullion coins that support the global economy. The minting of gold bullion coins in the 20th Century marked a turning point for the Mexican Mint and gold and silver commemorative coins are highly sought after by collectors and investors due to their competitive costs against their potential value. CoinInvest is always interested to hear from owners of Mexican Peso gold coins. We offer highly competitive prices based on current market value so you can be assured of receiving a fair and honest quote. If you do have gold bullion for sale, do not hesitate to contact a member of our staff who will be happy to calculate a fixed-fee offer on your behalf and confirm the same by email together with instructions of the transaction and delivery of your product to us.